We have just added some new language support to Google SketchUp 7.1, making '3D for Everyone' available to people who speak French, Italian, German, Spanish, Japanese, Brazilian Portuguese, Korean and Traditional Chinese. Today, I'm pleased to say "welkom" and "добро пожаловать" to those of you who speak Dutch and Russian as we release new language support for Google SketchUp 7.1 in your language. 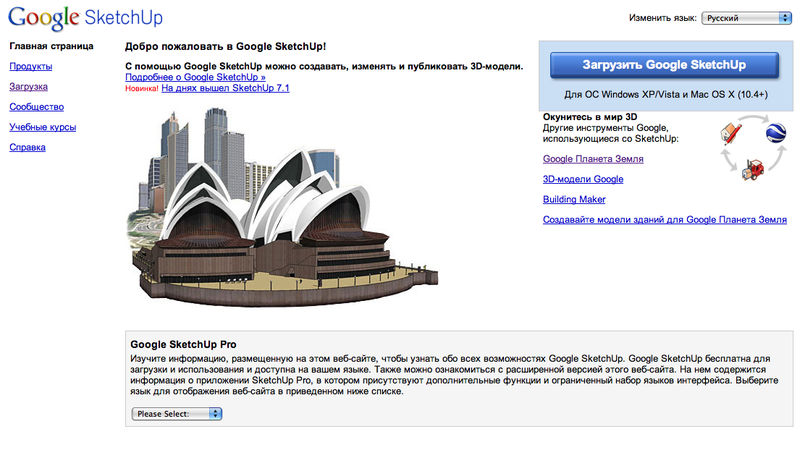 SketchUp 7.1 is now available in a total of eleven languages...but stay tuned. We've still got a few more to go! Update: Removed Polish from the list of languages in which SketchUp 7.1 is currently available. Woops- you're right. SketchUp 7.1 isn't available in Polish yet. Sorry for the confusion. Hi John. Why Polish language has been removed from this version? Do I understand correctly that there is not yet a Dutch translation of the PRO version? How soon can we expect it?